Employers are constantly hunting for top talent to add to their organization, and workers are always looking for the next new and challenging job opportunity. 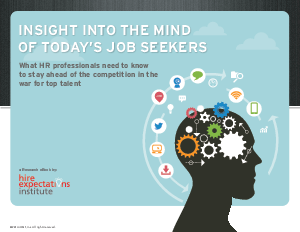 In order for organizations to hire top talent, they must first know where to look. Research conducted by iCIMS found that 62% of all employed and unemployed are currently open to exploring new opportunities! Posting your job in the correct places is just as important as posting a great description. Learn where job seekers “live” and how iCIMS can help you find them. By downloading the iCIMS eBook, you will learn about the online behavior of today’s job seekers and how using an applicant tracking system like iCIMS Recruit can help get your jobs in front of more eyeballs! Also, learn how easy it is to track the effectiveness of your overall recruitment marketing.